The holy grail of anti-aging treatments is to increase skin collagen. Collagen depletion, breakdown and malformation is the root cause of every visible sign of aging from wrinkles to laxity. If you’re old enough to worry about wrinkles, you’ve probably tried at least one collagen containing skin cream in the hopes of banishing signs of encroaching middle age. While you may have enjoyed some hydrating benefits, any collagen the cream contained just washed off in the shower. 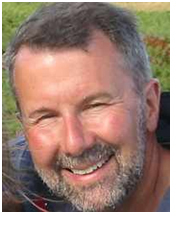 Dr. Richard Guy, professor of pharmaceutical sciences at the University of Bath, went on the record recently to try and set the record straight. “The idea created by many of these products is that collagen can get through the upper layers of skin and reinforce our own natural collagen, but this is preposterous. Dr. Guy joined a cadre of scientists objecting to an advertising campaign run by L’Oreal. 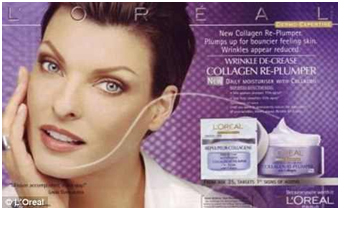 The scientists weren’t shy about asserting that “wrinkle reducing collagen creams are a waste of money.” Featured below is an ad from the campaign run by L’Oreal that kicked-off the backlash. L’Oreal’s Wrinkle Decrease Collagen is aimed at women aged 35-plus and claims to “reduce the appearance of wrinkles and creases”. It contains collagen ‘biospheres’ said to have the power to combat crows’ feet, dark circles and bags under the eyes. The bottom line is that anyone using such creams for a collagen boost is literally washing their money down the drain because the collagen ingredients just sit on top of the skin. Which begs the question: is it possible to build new skin collagen using a topical agent? The answer is a resounding “yes!” And the means to do so is surprisingly simple. Here’s a hint: vitamin C is involved in collagen synthesis from start to finish. Although collagen formation is a complex process, the steps in its synthesis can be summed-up in four pivotal points. 1) In the first step, the gene that codes for collagen needs to be expressed. A strand of deoxyribonucleic acid (DNA) opens up to allow a copy to be made of the collagen code. In a process known as transcription, vitamin C enables the code for collagen to be copied to a molecule of messenger RNA (mRNA) that travels out into the extracellular skin matrix to begin the actual coding. 2) In the second step, mRNA instructs fibroblast skin cells to start producing subunits of collagen known as procollagen. Procollagen will later be assembled into mature collagen. 3) In the third step, procollagen units are glued together in sets of three by a molecule named hydroxyproline in a process known as hydroxylation. The sets of three form the famous triple helix known as a collagen fibril. Vitamin C is used to form hydroxyproline and without sufficient supply, hydroxylation can’t occur and no collagen is formed. 4) In the fourth step, hydroxylation again takes place but this time vitamin C forms hydroxylysine which glues the collagen fibrils together into mature collagen, or collagen bundles. Vitamin C is essential for the initiation of transcription, the formation of the procollagen and the extracellular cross-linking of the collagen fibers (Murad 1981). The image below represents a single subunit of procollagen. Three of these combine to form a triple helix as depicted in the center image. Hydroxyproline does the binding. 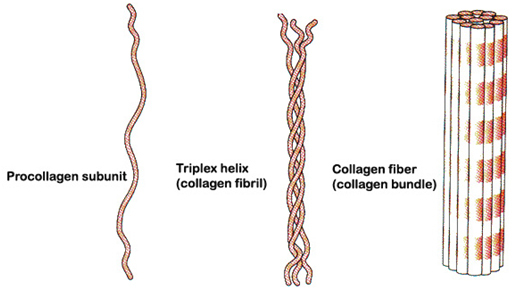 Finally, scores of collagen fibrils (triple helix) are bound together to form a collagen fiber as depicted in the image on the right. Hydroxylysine binds collagen fibrils into collagen fibers/bundles. Vitamin C enables every step along the way. So it’s easy to increase skin collagen, right? In theory and in practice the answer is yes – just apply topical vitamin C. But the welter of misinformation similar to the marketing claims made by L’Oreal prompting objections from the scientific community is extremely problematic. If you look closely at L’Oreal’s marketing claims, they may be intentionally misleading but they’re not illegal. Consequently manufacturers can make similarly misleading claims about their various vitamin C products and it would take a research scientist to tell you if the claims are legitimate. You’ve really got to be careful about the type of vitamin C you’re putting on your skin. Read our post “Why it can be Disastrous to Use the Wrong vitamin C on Your Skin” to find out what can happen if you’re not careful. Find out if the type of vitamin C in your skin cream is accelerating skin aging by reading our post “Is my Expensive Vitamin C Serum Killing my Skin?” If you want the cliff notes, the safest and most effective type of vitamin C for increasing skin collagen is pure ascorbic acid. This is the biologically active form found in nature and used in collagen synthesis. Any vitamin C derivative used in skin care products must be broken down into pure ascorbic acid for benefits to be realized. Some popular vitamin C derivatives such as ascorbyl palmitate are proven not only to kill skin cells, but to also be cancer promoting. Obviously, it’s important to understand what you’re putting on your skin. Visit us in our Vitamin C and Skin Care Forum to find out how women are successfully using pure ascorbic acid to literally erase time from their faces. A middle-aged woman has 425% less vitamin C in her skin than does a woman in her late teens and early 20s (Shindo 1994). You can safely and effectively boost your skin levels significantly by following a trusted and proven protocol. If you’re like most of our community members, you’ll be amazed by the results. Nice post. I was checking constantly this blog and I’m impressed! Extremely useful information specifically the last part I care for such information much. I was seeking this particular information for a very long time. Thank you and best of luck.